I am a user-experience designer with over 5 years of experience developing enterprise-level, storage-server interfaces. I approach all my projects with curiosity and empathy which have been honed through my extensive Design Thinking training. I have a degree in computer science and front end web development experience which means I can create prototypes and understand the constraints of the format. UX Designer, Story Teller, Creator. 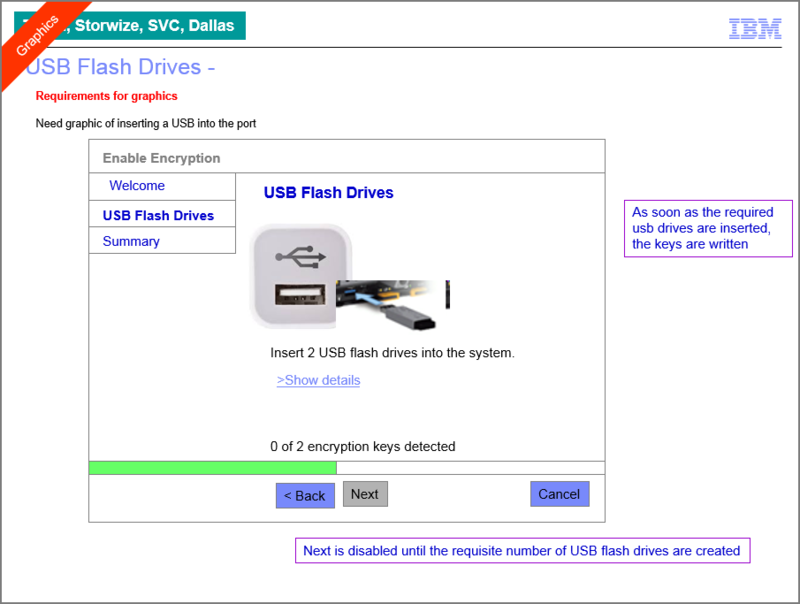 Product management requested a new feature that would allow users to encrypt the data stored on their server. 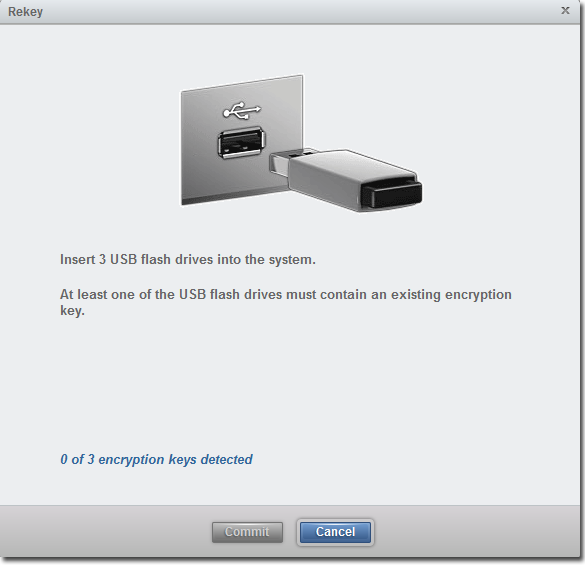 The solution had to use USB-based unlock keys and function similarly for three other storage products. A drastically streamlined wizard that was optimized to reduce the number of back and forth trips between the user's laptop and the storage server. Team: Me and two other designers, each from different product lines. 1 graphic designer for icons and layouts. My Role: Drafting the process flow, creating the wireframes, user testing. The design team and two engineers sequestered ourselves in a conference room and listed out the bare minimum requirements and edge cases that we would have to account for in our design. We charted potential work flows to find any branches that could be combined or eliminated. 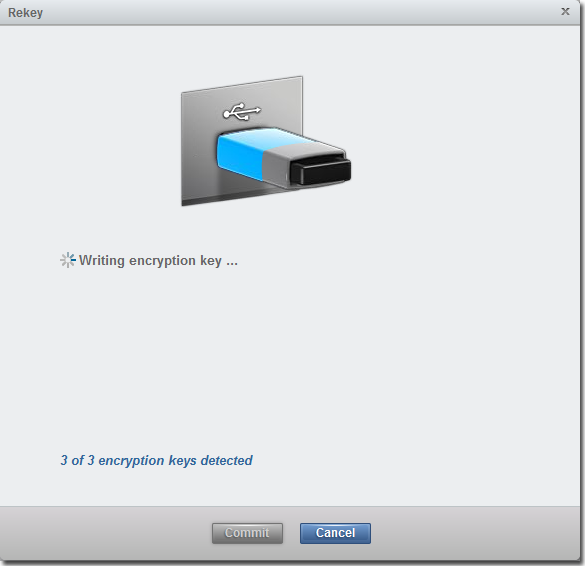 Encryption setup had to be run from the administrator's workstation. Early in the design process, we visited customer data centers to see how they would configure system for encryption. A key insight from this visit was that the storage server is usually in a separate room (even a separate floor) from the administrator's workstation. I created a wireframe PowerPoint version of the wizard and worked in a test lab with an IBM QA tester. I would advance the slides as he clicked the buttons to simulate how the wizard would work. A key insight from this test was that users do not read the text on the panel. In response, I removed as much text as possible and added animations to show users what they need to do. This early wireframe had an image of the back of the system and where to insert the USB drives. 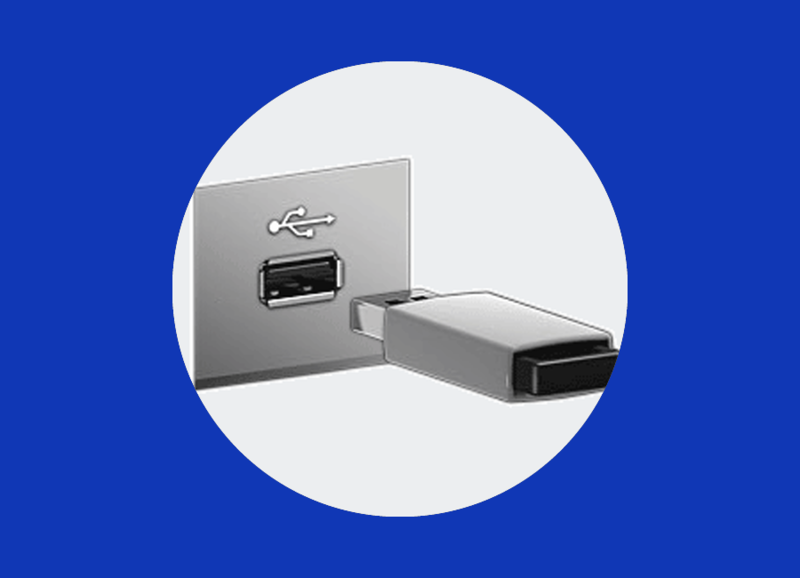 However, I replaced it with a single USB port because the wizard needed to support several products and users never had a problem locating USB ports during early testing. Early versions also used tabs and Next / Back buttons. I removed these tabs because it reduced the amount of text on the screen (which users never read anyway.) I also removed the "Back" and "Next" buttons because we discovered that the system could determine which step the process was in and therefore the system did not have to wait for user input. The final design responded to the user automatically. 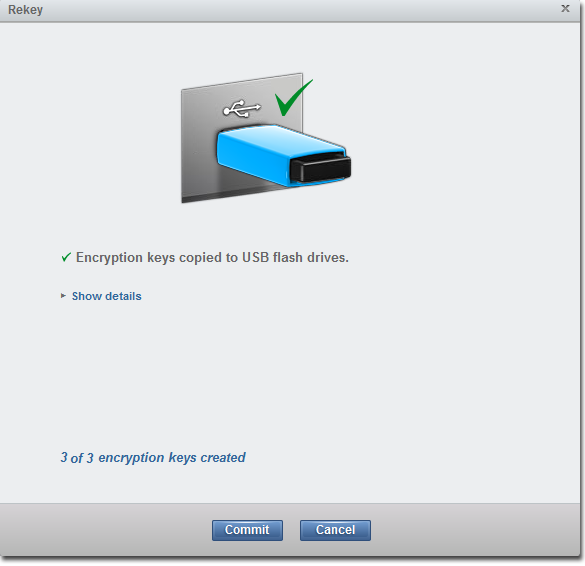 The only time the user must click the dialog is to "Commit" the encryption after all the keys have been made. 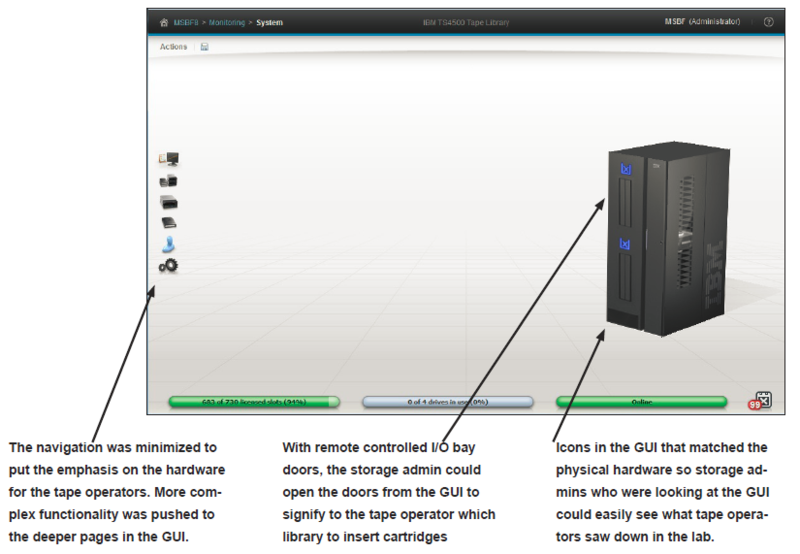 Product management needed a fresh GUI design for an aging product to coincide with the next generation of hardware. The existing GUI was built on out-of-date web technology and had not been optimized to the way users actually interacted with the product. A contemporary GUI that addressed administrator's needs for simplified management of more and more storage but with reduced IT staff. Team: Me, a UX architect, a product architect, and a graphic designer. My Role: Sole UX designer on the project. I adapted the high-level concepts from the UX architect and provided feedback to graphic designers who created the look and feel. I also UX-tested the GUI while web developers implemented it. 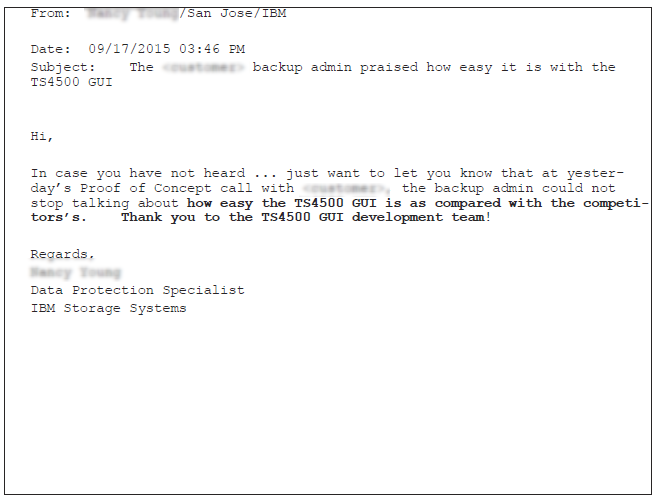 The product we were replacing (TS3500) sent daily status updates which contained detailed system data. Before starting the designs, we used this data to find most common configurations. I interviewed existing customers and technical sales representatives to identify storage use cases that were not visible in the data. 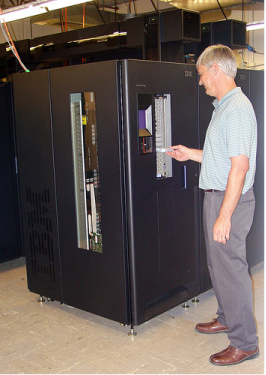 Tape Operators are entry-level data-center employees who use only the most basic functionality. Storage Administrators are highly skilled architects who use the most complex features. Storage Admins and Tape Operators must communicate with each other to load and unload the correct tape cartridges. However, the two users are rarely in the same physical location. Tape storage is the last link in a data center chain which means it is not used frequently. It is not uncommon for users to log in only once a week or even less. Photo: A tape operator loads cartridges into the system. For the new GUI, we created a center pod on the dashboard to clearly show what the user needs to track on a daily basis. My original design showed how many cartridges were in the I/O station door because a full door means no work is being done. However, after showing wireframes to our target users, we found that tape drives were a more appropriate fit for the center pod because they said that drives represent the data throughput of the system. 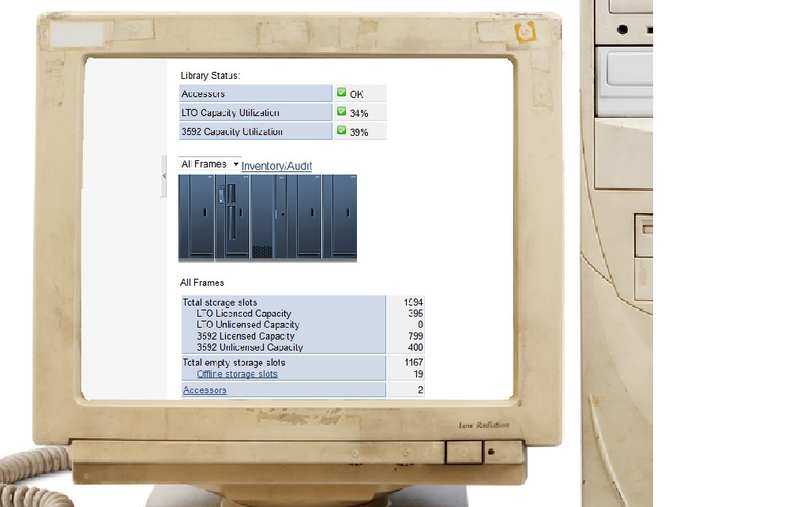 Key Customer Quote: "Tape drives are the heartbeat of my system"
Final graphics of the system dashboard show important status to the storage administrator. 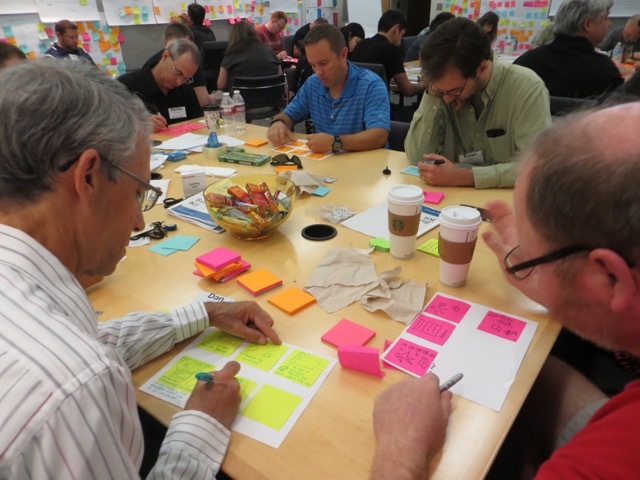 I studied at IBM's central bootcamp in Austin, Texas for Design Thinking. The training has improved the way I facilitate design sessions and how I collaborate with all stakeholders. 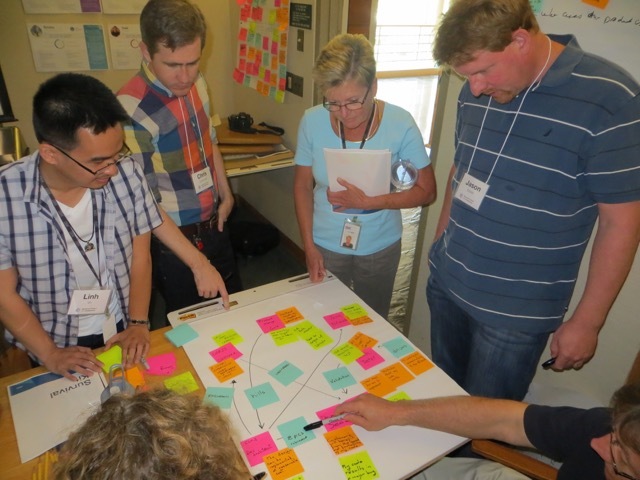 Design thinking is a method for creative problem solving across teams with varied skill sets. In the past, IBM was an engineering-dominated organization that focused on features instead of user needs. With Design Thinking the emphasis has changed to deliver products that focus on positive user experiences. 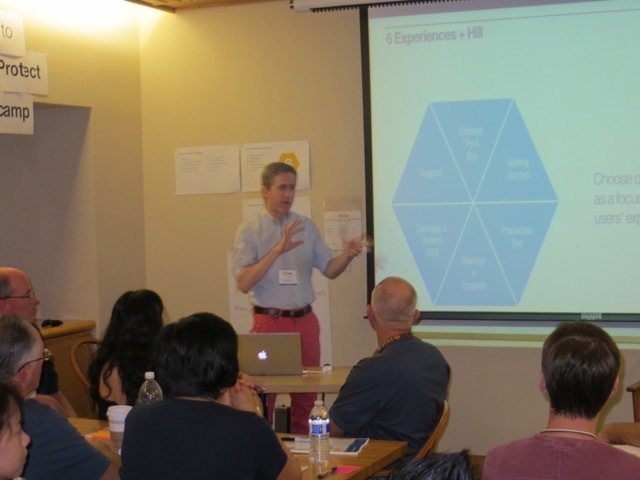 In 2015, I lead two workshops to teach teams of all backgrounds (designers, engineers, technical writers, and product mangers) how to use Design Thinking. Duration: Each workshop lasted one week and consisted of all-day interactive sessions. 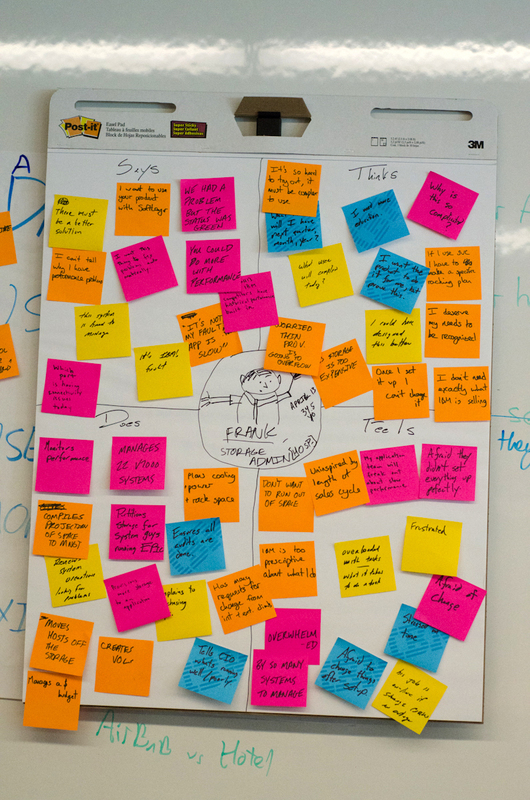 Curriculum: Slides and syllabus were based on the IBM Design Thinking approach. 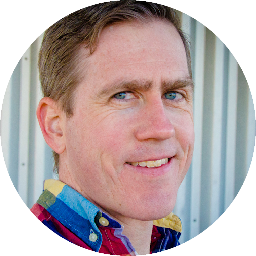 My Role: I lead sessions on creating user task flows, sketching storyboards, and user testing. I taught participants how to create "As-is" scenarios. As part of the exercise, team members collaborate to create task flows of how users currently use the product. The team quickly found gaps in our understanding and time consuming loops in the product setup that needed to be fixed as soon as possible. Design is not about a single UX "Creative" who dominates every detail in the experience. Projects are more successful when all members of the team are empowered to improve the experience for the user. By teaching everyone the methods to find user needs and pain points, everyone has a stake in making a better product. Workshop participants emerged from the experience equipped with the fundamentals of Design Thinking, had a better understanding of design terminology, and were able to particpate in design sessions for IBM's next generation of products. A product team was ready to release a new product at the end of the month and wanted a last-minute check to ensure that the configuration and operation of it were easy to understand. I designed a user study to test the product which involved researching it, creating test materials, recruiting users, and proctoring it. My Role: User study designer, proctor, data synthesis and final report author. I worked with the engineering project lead (based out of Tel Aviv, Israel) to understand the new product and features. I performed a heuristic evaluation of those new features and identified potential problem areas. I designed tests to exercise those potential hot spots to see if they really were problems. 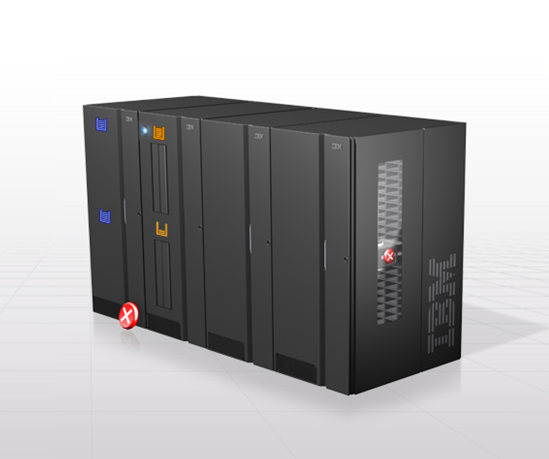 The product I tested was designed for large companies with several storage servers. Therefore, I focused my recruiting efforts on admins at banks and hospitals. I recruited four users from four different companies. The number of participants was based on the recommendations from Jakob Nielson's "discount usability engineering." 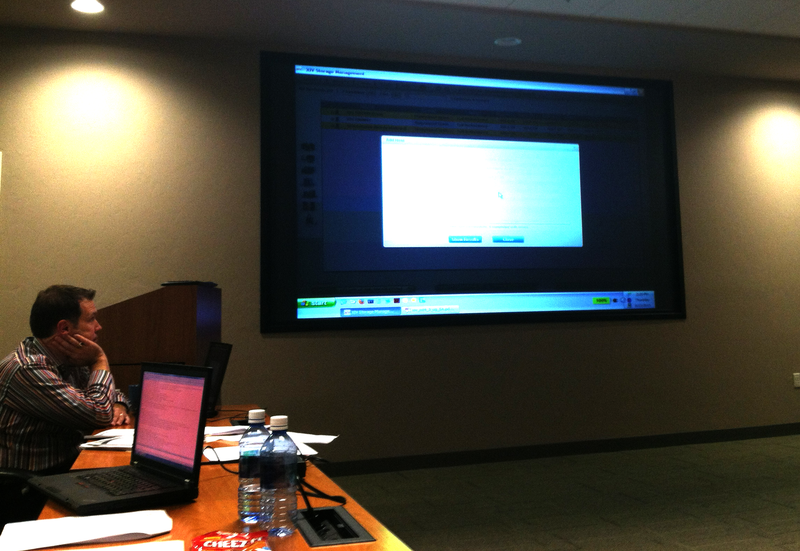 I scheduled each user to fly to Tucson, Arizona where I administered the test in an IBM conference room. Testing lasted all day and covered many complicated processes. I gave each customer a discreet set of scenarios to work through. 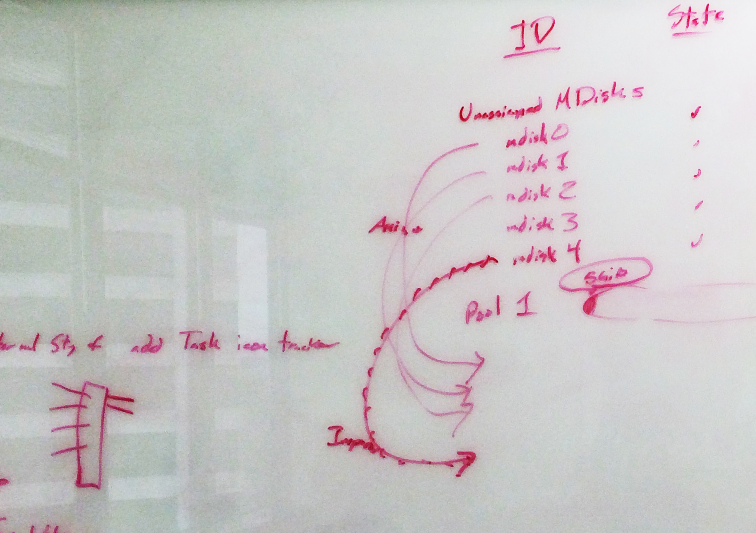 I wrote out the tasks to not give away where the function was located or how it should be performed. I provided each user with a laptop and their screen was projected above them. This setup allowed me to observe how they used the GUI without distracting them by hovering over their shoulder. Photo: View from my vantage point. 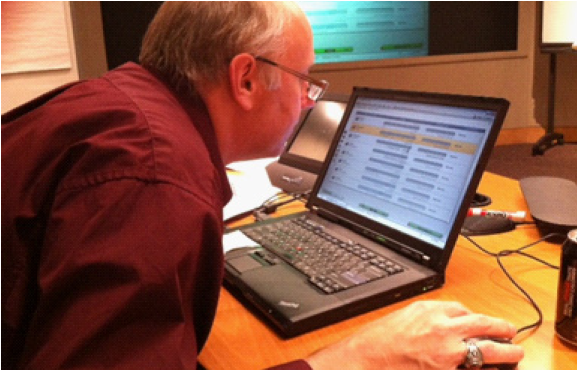 A test participant sits at his laptop while his screen is projected at the front of the room. I gave each user a packet with scenarios that they had to work on during the test. There were 14 questions that took anywhere from 5 minutes to an hour to complete. I left plenty of space in between questions for the users to make notes. I found that in real-world data centers, there are multiple job roles that would be required to complete the wizard. As the setup procedure was implemented, steps were out of order and would require both admins to be in the same room which was impossible in most IT organizations. To illustrate this problem, I took a screen shot of the procedure and delineated who would be responsible for each step. It helped illustrate to the engineers how different people would have overlapping steps. 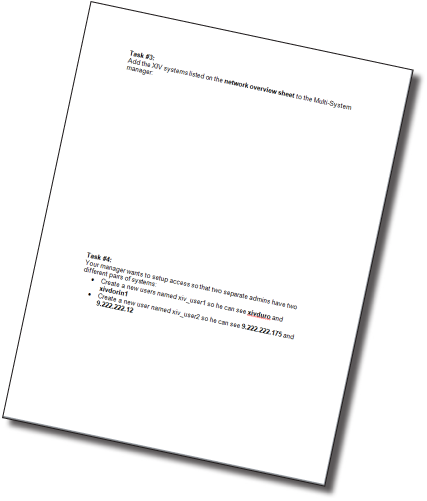 Although the problem could not be fixed in time for release, I provided alternative solutions such as a pre-install worksheet so the network administrator could record details that could be used by the server administrator during the installation. When a network application needs more storage, an IT Administrator must install more hard drives then assign them to the associated storage pool. In previous versions of this product it wasn't always clear that administrators had storage to add. This caused administrators to waste thousands of IT dollars as hard drives spun for weeks unused. So I used the power of graphic design to help users become more aware of what they have and what actions they need to take. The following images are high resolution 1 to 1 specifications that I created for development to use during implementation. I was responsible for the layout. A graphic designer provided the 3D icons. The first thing I did was add a temporary "gutter" that shows big bold icons of the storage that has not been assigned yet. Once an admin assigns all the available storage to a pool, the icons and gutter disappear creating a clean look to the page. I did this to create something that resembled an email inbox that encourages users to clear out unassigned items to get the system back to "inbox zero." 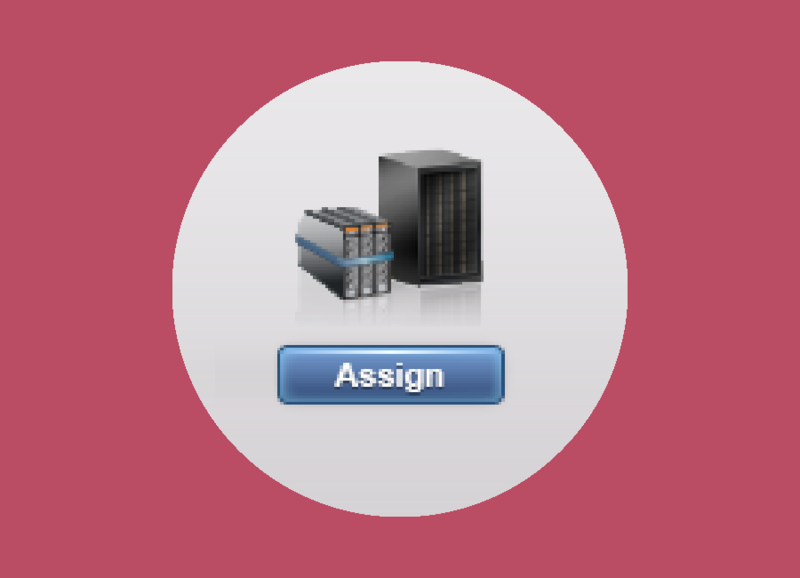 For admins who are familiar with the page, the storage icons are quite striking and not easy to miss. 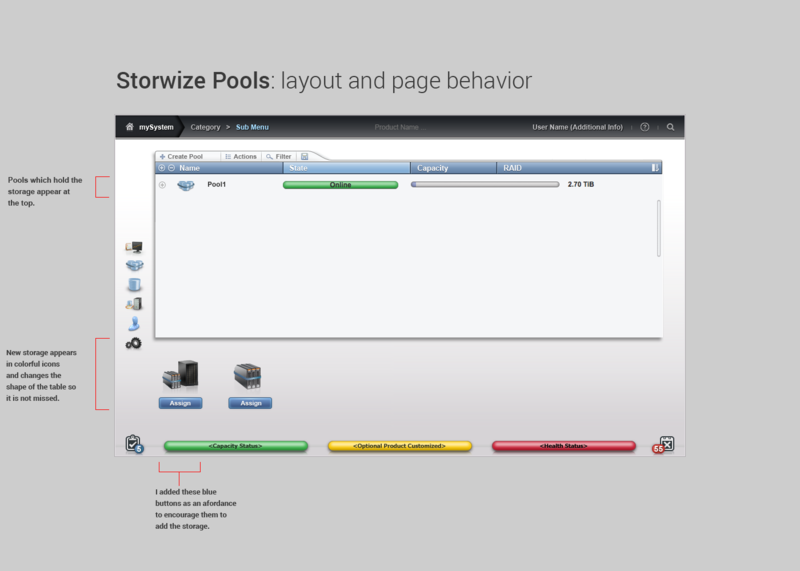 If the user is on the Pools page and sees the storage they want to add to a pool, they click the "assign" button and the following dialog appears. When administrators get new hard drives, they must distribute them among the pools (typically each department in a company gets a pool.) This dialog was designed to easily guide users through selecting how much storage to give to the pool they selected. 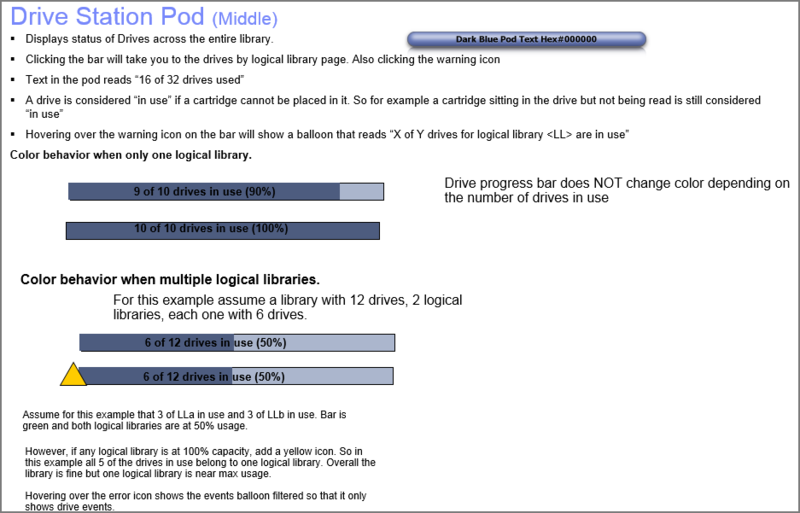 The main interaction on this dialog is the Drives input spinner. I wanted to make adding and removing storage as easy as clicking the up and down buttons. The storage totals are calculated in real time so that admins know precisely how much they are adding. This calculation was setup on the right side of the screen and mimics the total you might see in a restaurant receipt where each item and its price is listed next to it. 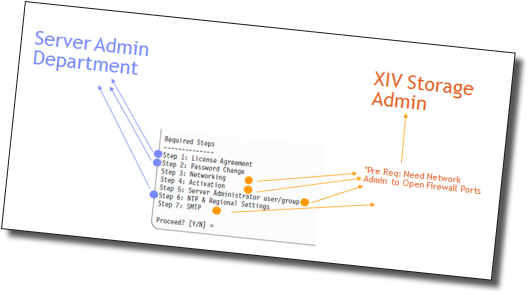 In the end, the layout of the dialog provides a clear top to bottom progression that limits backtracking or cross referencing. Users could easily see when there was work to be done and were guided on where to click.